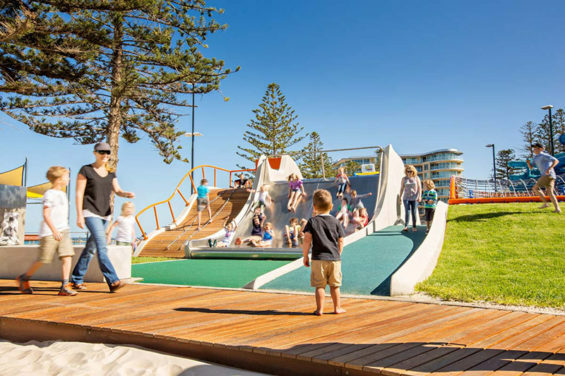 The playspace represents a new benchmark; an innovative play experience that has revitalised the Glenelg Foreshore, creating a destination where children and adults can play, socialise and connect with the coast. 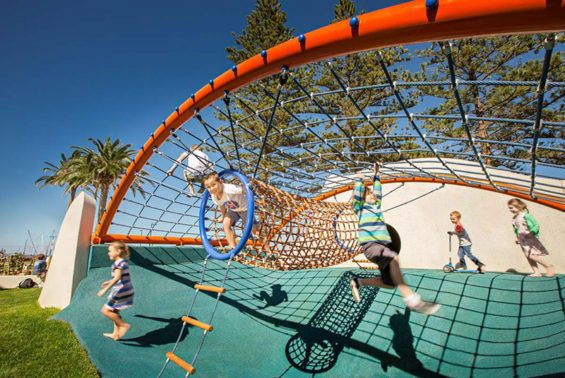 The design of the playspace borrows from the surrounding landscape context as well as the history and culture of the Glenelg Foreshore. The mounds and precast concrete walls reflect the waves and dune formations, reinforced by the inclusion of a giant 4.0m wide slide and elevated timber platform that form the ‘prefect break’. The climbing wall, cubby and tunnel become a giant sandcastle for children to explore while the concrete walls and brightly coloured dome net represent an abstracted beach towel draped over the site. 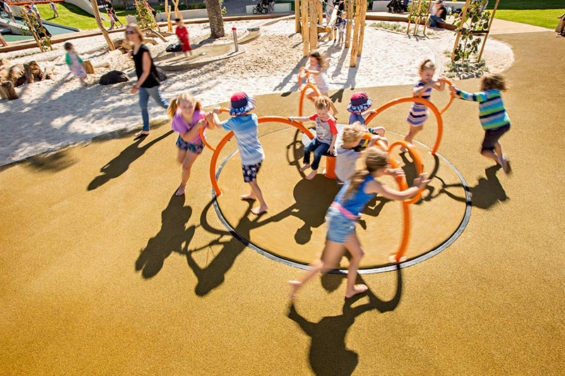 The nature based play elements draw inspiration from the indigenous vegetation of the area. The structure and aerial roots of mangroves are reflected in the custom timber log climb, rope balance and boardwalk. 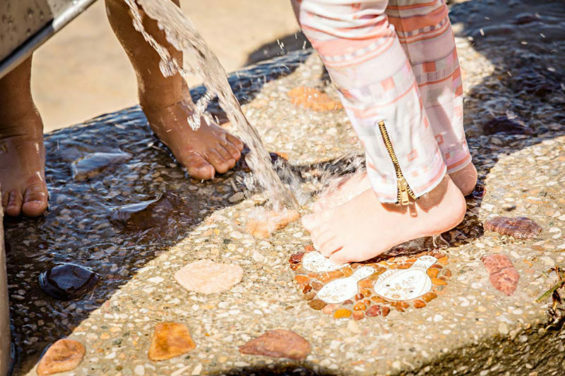 The intertidal environment of the mangroves is reimagined as water play in the giant sand pit. A diverse gradient of challenge is integrated across the playspace, catering for all ages, genders, cultures and abilities without segregation or restraint. This approach enables children to make decisions, gain confidence and tackle different levels of risk. Sustainability principles were embedded in every aspect of the project. All the existing trees were retained, with the planting of numerous trees as a long‐term shade strategy. 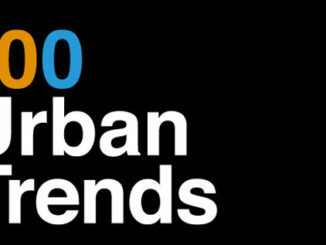 Local native plants were selected to provide additional biodiversity. The project also prototyped ‘Living Soft Fall Turf’ for the first time in South Australia, providing a growing impact attenuation solution, rather than artificial surfaces. Renewable materials are utilised in many of the play elements, with timber and rope selected over steel and plastic. Also, a high proportion of the equipment is custom designed and made in Australia, with WAX collaborating with local manufacturers to create bespoke play elements. The project involved an extensive engagement processes that empowered the community and particularly children, to influence the design and decisions made. Engagement through a ‘Family Fun Day’ used cognitive mapping and preference voting to provide information regarding the community’s ideas and aspirations for the playspace. Further feedback was given through the Council’s website which highlighted strong support for the project. The project demonstrates the community benefit that can be delivered by an innovative and high quality playspace. 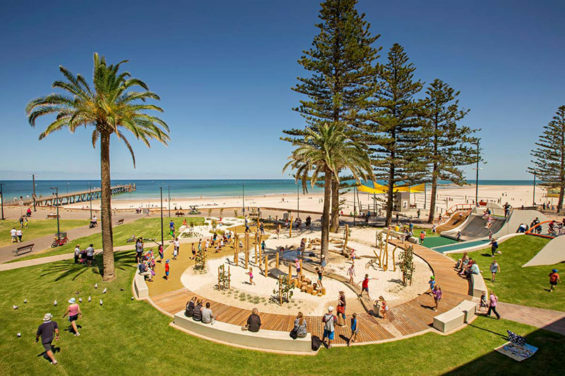 The Glenelg Foreshore Playspace has created a place of congregation and interaction that fosters inclusion, irrespective of the social or economic factors while revitalising and activating adjacent commercial and tourism areas. 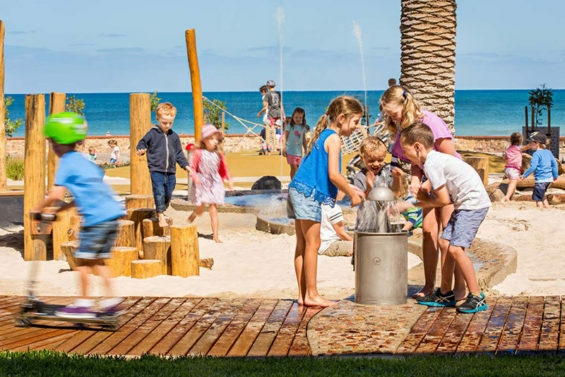 The playspace has reinvigorated the Foreshore creating a valued asset which is now an exemplary play destination in South Australia. Its success is measured by the two hundred plus children and adults who constantly visit since the opening in January 2016.